Bold, vibrant and striking are just a few words that come to mind when describing Studio22’s latest exhibit by the talented visual artist, Neli Nenkova. 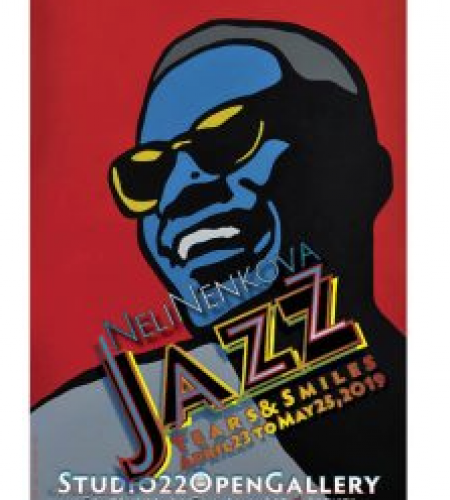 The new solo exhibit entitled JAZZ - TEARS AND SMILES will be on display from April 23rd to May 25th and will feature twelve 24” x 36” paintings of some of the greatest jazz musicians of all time. The large acrylic paintings go on sale to the general public on April 27th and accessibly priced poster art of some of the originals will also be available for purchase at the gallery. Jazz - Tears and Smiles, is an exhibit that appeals to both jazz lovers and art collectors alike. As is the music commonly referred to as ‘jazz’, Nenkova’s latest body of work is full of range, diversity, richness and beauty. Nenkova’s pieces do more than visually captivate the viewer; through the use of vibrant colour and brushstroke, the artist’s work succeeds in not only capturing the improvisational element unique to this music genre, but also immortalizing the soulful creativity of these larger than life legends. “Billie, Ray, Ella, Louis, Etta, Chet, Miles, James, Aretha, Amy, Frank and Nina have pushed me to question and rediscover myself artistically by using a novel painting style that aspires to mirror their purity, expressiveness and force of feelings. Their songs often born from vastly painful experiences contrast beauty and sadness through the inner power of each performer. It is that energy extended to the listener my paintings seek to highlight becoming a visual representation of the bittersweet excitement we all know and love as Jazz.” - Neli Nenkova Nenkova’s inspiration for these works are revealed in the titles of her paintings. From “What a Wonderful World” to “Love is a Losing Game”, the essence of these songs are played out on the faces of their messengers. There is pleasure and there is pain - tears and smiles. Nenkova’s stunning canvases invoke the feeling of pure joy one gets when listening to these great masters of Jazz. She extends the vibrancy of their songs and reminds audiences to revisit their timeless musical heritage. Nenkova succeeds in making the images of these artists as iconic as their music. Neli Nenkova is a Sudbury based visual artist with more than 20 years of art experience in Europe and Canada. Nenkova is also a Provisional RGD Graphic Designer. She hold a Bachelor’s Degree in Fine Arts and Fashion Design, as well as an Advanced Diploma in Graphic Design. Nenkova is a recipient of numerous art and design awards, with the latest including: OSA 7th International Miniature Print Biennale- Winner Category Intaglio, Ottawa, Canada; 50 Carleton Award for Logo Design and Studio123- Design Award for Northern Ontario. In 2016, Nenkova was one of seven finalists in the national competition for a new tourist logo of Bulgaria organized by Ministry of Tourism of Republic of Bulgaria. Neli Nenkova’s paintings are in public and private collections in France, Bulgaria, Italy , Germany, Greece, USA, Japan, Turkey, the Vatican and Canada. Jazz - Tears and Smiles is on exhibit at Studio22 Open Gallery from Tuesday, April 23rd until Saturday, May 25th.